If you fancy a little light cooking, these wonton wrapper parcels are so worth the effort – hot crispy parcels of tangy cheese. Delicious. 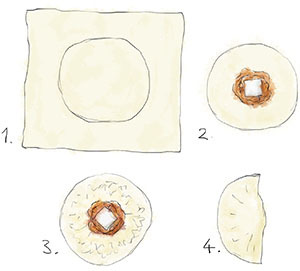 Use your finger or a pastry brush to dab egg around the circumference of the disk. Heat 2 tbsp of vegetable oil in a frying pan and cook the parcels for about 1 to 1 1/2 minutes on each side until crisp and golden. This recipe originally appeared with a frozen watermelon martini recipe and a discussion of public swimming pools. The wontons can be brushed with vegetable oil, then baked in a 400 oven for about ten minutes, rather than fried. They can also be fried in advance, then reheated in a warm oven. They freeze best uncooked, and can be baked from frozen in about 15 minutes.